July 15, 2002 Summer is finally here with heat enough to send a dog flopping into a mud puddle. 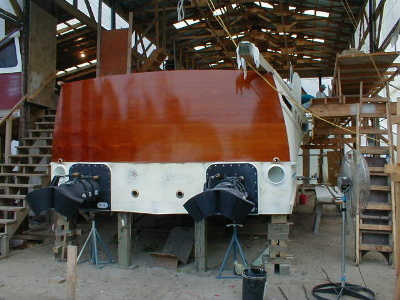 You can see yourself in Cherokee’s transom, as the lucky seventh coat of varnish has been applied. The crew has been using AwlSpar varnish, a fast-drying, single-part spar varnish compatible with AwlGrip two-part clear urethane. The seventh coat will be sanded flat (blocked out). The name will be painted, and additional coats will be sprayed on. The last coat (two-part urethane) will be sprayed after the transom sits for several weeks to assure all solvents have flashed off. 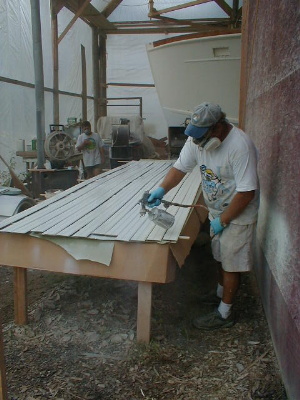 The crew is now applying paint below the varnished transom to finish the priming of the hull. 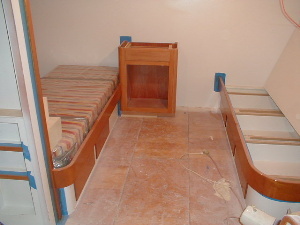 The bunks in the master stateroom are getting varnished, and now cradle lovely new mattresses. Below left is the swing-out cabinet on hinges that allows emergency access to the engine room. Right shows the cabinet closed. 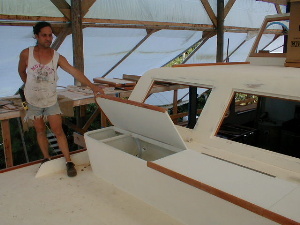 Above Bryan is demonstrating the finished forward deck boxes. The small visible opening to the left will hold an LP gas bottle – the kind you can buy at any convenience store. This bottle will power the gas range. In the same compartment to the right is the domestic water fill. 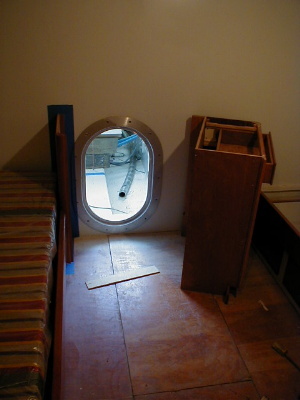 This compartment can be locked to avoid tampering with the potable water on the boat. 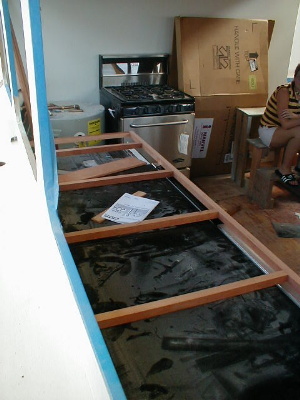 Above right Kerry is painting the bead board ceiling planks which will be used as headliner throughout the boat. Below, the first step in building a galley took place today. 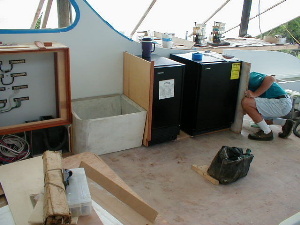 A framework has been completed to hold the counter top over the refrigerators and dishwasher. To the left is the new ice chest being built by Jeff. It is adjacent to the ice maker, allowing for easy ice shoveling. 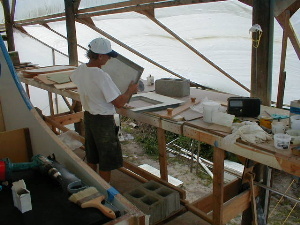 To the right, Jeff is finishing up the lid for the chest. 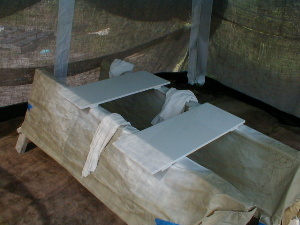 The chest is constructed out of Divinicell and fiberglass. “We should have just bought a twelve dollar ice chest from Walmart and thrown a cushion on it,” observed Blake. Problem-solving, think-tank, brainstorming sessions have lately revolved around this question: how do we keep dust and other finite trash out of our pretty top-coast paint jobs at a site like this? 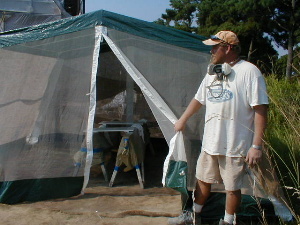 Solution: lay carpet on the ground, and erect a net-tent with burlap covering next to the water to catch the clean, Core Sound breezes. Kerry models the tent below, which contains pristinely-painted door panels.